The parish is by far the largest within the walls of the city, comprising over half the area if Dallaway (I p171) is correct, yet a dedicated church was only built in the C19. Previously, the parish worshipped in the cathedral and the vicar was sub-dean, hence its alternative name of Subdeanery parish. Initially it used the nave and then, probably from the late C15, the north transept. This was partitioned off and later fitted with galleries and the east chapel of the transept served as the chancel (Leeney (SAC 86) p163). 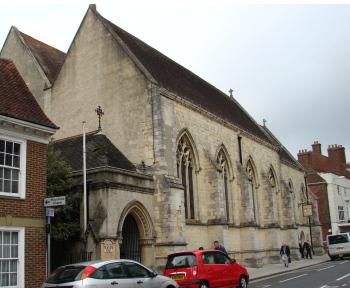 The most likely reason for this arrangement is that when the cathedral was moved from Selsey after 1075, it was built on the site of the existing main church in the city and the parishioners were permitted to go on worshipping on part of the site. The drawbacks were obvious in terms of noise and access. In 1841 the partition was removed and plans for a separate parish church were supported by George Chandler, the dean (Foster (ed) (Otter Memorial Paper 13) p17), who was an enthusiastic member of the Ecclesiological Society. After an appeal, a handsome design by R C Carpenter (Eccl 12 (Feb 1851) p68) was built in 1848-52. Carpenter designed a hall-church of ashlar, with nave and aisles of the same height, and tracery in early C14 style. This was his preferred style, but here it was a sensible choice as there is little work of this period in the cathedral to compete. The wider south aisle is gabled, but the north one has a lean-to roof. 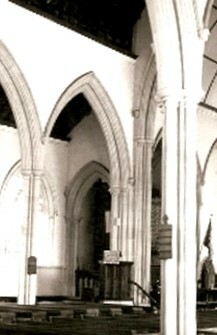 The tall arcades and chancel arch have slender shafted piers and moulded heads. Much of the carving, which was never finished, notably the head-stops on the labels, is by ‘Nicoll of London’ (1 p15), probably a misreading of T Nicholls. Carpenter’s intended south west tower was not built for lack of money, but in view of its position close to the cathedral, this may have been no bad thing. Instead, a porch was added in 1881. Compared with Carpenter’s work, the detail is coarse. The architects may have been A M Dunn and E J Hansom, who had made plans in 1876 to complete the west end (A 16 p236). In addition to a porch, then intended to have two storeys, these called for a vestry, baptistery and bell-turret. Most stained glass was blown out in World War II, lightening the interior. Always overshadowed by the cathedral, a dwindling congregation and the need for major repairs led to redundancy in 1979. 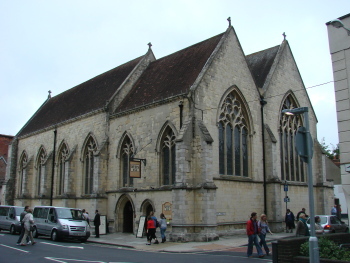 The parish was united with St Paul’s and after extensive repairs and the removal of the fittings, the church became an antiques market and more recently a restaurant and bar. 1. (East window, centre light) 1947, by Barton, Kinder and Alderson (CCC file). 2. (South aisle fourth window) 1842, W Wailes, who altered it in 1848. Until 1894 it was the east window of the south aisle of the cathedral (JSG 31 p71). Reredos: Caen stone, designed 1872 by A M Dunn (KD 1878). This would seem to be Dunn’s earliest association with the church.